Americans for Legal Immigration PAC (ALIPAC) is issuing new endorsements today for the Republican Senators who cast "Nay" votes on cloture for three Amnesty bills defeated in the Senate last week. Each bill would have given Amnesty to millions of illegal immigrants which would attract more illegal immigration into America while further undermining America's existing immigration laws which are being sabotaged by special interests in Washington DC who have more control over US policies than the American public, laws, and Constitution at this time. Politicians and deep state bureaucrats responsible for the lack of enforcement of America's existing immigration and border laws are to blame for millions of lost jobs, billions in depreciated wages, mass voter fraud in states like California and Nevada, and the thousands of preventable deaths caused by illegals each year like the murder of Kate Steinle. ALIPAC endorsed Senator Cruz last week for his leadership in the fight to stop the DACA Amnesty bills and now extends endorsements to Senators John Barrasso (R-WY), Steve Daines (R-MT), Michael Enzi (R-WY), James Inhofe (R-OK), John Kennedy (R-LA), Mike Lee (R-UT), Jerry Moran (R-KS), Rand Paul (R-KY), Ben Sasse (R-NE), and John Thune (R-SD) for their cloture votes against Amnesty for illegal immigrants. "Americans owe these Senators our support and praise for saving our nation from the pitiful fate that awaits us all if the DC special interest groups, global corporations, and billionaires like George Soros, ever obtain Amnesty for illegal immigrants," said William Gheen, President of ALIPAC. "When the votes were counted, these men came down on the side of Americans who want our existing laws enforced instead of Amnesty for illegals." ALIPAC activists have been calling GOP members of the Senate to reject Amnesty, and before the vote, ALIPAC activists hand-delivered a certified poll conducted by Barometer Polling Company which proves 67% of likely GOP primary voters in America want existing immigration laws enforced instead of Amnesty for illegals. Activists are now being asked to flood the DC and District offices of the newly endorsed senators with calls supporting and thanking them for voting against Amnesty for illegal immigrants. ALIPAC is currently working to inspire, identify, and support GOP primary challengers running against corrupt incumbents who support Amnesty for illegals. 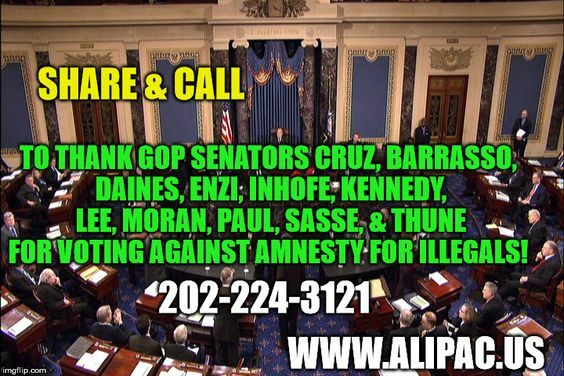 Americans who oppose Amnesty are encouraged to vote for, volunteer for, and donate to candidates endorsed by ALIPAC. Last edited by ALIPAC; 02-20-2018 at 11:35 AM. Please call and thank these GOP Senators for listening to your voices! Please call their DC office and locate their district offices (CLICK HERE) to call and say thank you, tell them of ALIPAC's endorsement, and encourage them to stand strong against Amnesty in the future! Do we know that those on the list voted specifically against the amnesty component? I only say that because I know for a fact Sen. Rand Paul has heavily supported amnesty for illegal in the past and as far as I know still does. Cruz and Inhofe are the only two that I know for a fact voted consistently with their past positions on illegal alien amnesty. No. We do not know why all of these voted against the bill. What we do know is when the rubber met the road, these Senators did what we asked them to do and voted against Amnesty bills. We want to reward and encourage that behavior as they will certainly face punishments from the pro Amnesty side. If Rand Paul or any of these make any comments or votes directed towards Amnesty for illegals from this point forward they can endure the sting of losing ALIPAC's endorsement which will draw attention to any such betrayals of their American voters. Beezer, MW and GeorgiaPeach like this.